Exercise and Relationships - Can It Really Get That Bad ? This morning I grabbed my IPad over tea to catch up with the WSJ. In the Living Section was this article by Kevin Helliker: A Workout Ate My Marriage. As Kevin writes, "Exercise can set off conflict about family, free time; Errands vs. English Channel. Now being involved in fitness and wellness I wondered, is this as big of a problem as Kevin thinks ? I mean we are always talking about the fact that people don't exercise enough. How often are people exercising too much and if so can it lead to the end of a relationship ? I guess its possible and happens but how often ? The effect of extreme exercise on divorce rates isn't clear. Even if research showed a higher rate of discord in homes where just one spouse is an endurance athlete, exercise could be a consequence, rather than a cause. Among endurance athletes, though, resentment on the part of spouses is a common topic. The phenomenon may develop into what Pete Simon, an Arizona psychologist, triathlon coach and blogger, calls "Divorce by Triathlon." "I often wonder how many lonely wives, husbands, children of triathletes are out there wondering when the insanity is going to end," he wrote. Now Kevin is a good reporter and Pete is an accomplished coach but couldn't we read more about how exercise is bringing families and couples closer together ? What do you think ? What is your experience ? 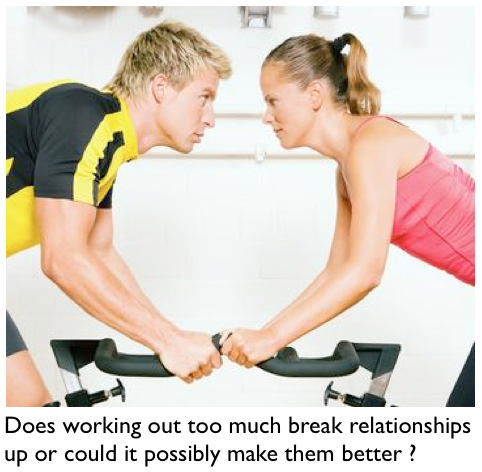 Do you know of a situation where working out broke up a marriage ? Do you think couples and families can be closer as a result of being active ? If so, please share your views with me, Bryan O'Rourke. Can working out too often make marriage and family life that bad or make it better ?